I am fighting a cold and a cough. I thought it was a 24-hour thing but it has lasted longer than I expected. I probably caught it from someone in my office because lately there are a lot of sneezers and coughers around me. This is not the time of the year to feel sick. I have been constantly washing my hands to prevent picking up germies but obviously this wasn’t enough. I haven’t started my Christmas shopping; I have ideas but haven’t yet gone online to find the particular gifts I have in mind. Plus, the work pace has stepped up because people are trying to wrap things up before the end of the year. I need energy and positive thoughts. Number one on my list is Vick’s VapoRub. It is mentholated and contains eucalyptus and the combination of the two ingredients is magical. You might remember this from your childhood. It comes in a little blue jar and you can find it at any drugstore. Last night I could not breath through my nose at all and my son reminded me that I used to give him Vick’s when he was little and he was stuffed up. Presto! After a few applications, I can breath again and my cough is getting a little better. After that, the only tried and true things I can suggest are: hot tea (with honey, if you like), lots of fluids such as juices and soups, soft tissues (there are some that have Vick’s in them) and rest, rest, and more rest. I went to bed early, slept through the night (thank you Vick’s) and I am glad that I did because I know my body needs all the energy it can get to fight this bugger. Be careful out there and please take care of yourself! 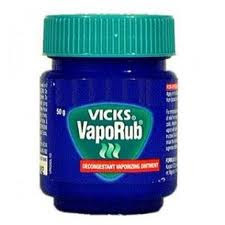 Vicks stays in my medicine chest and also use the liquid in my humidifier. Sambucol and elderberry juice are two more have to haves for those rare times I get some sort of respiratory illness. fortunately, I’m not sick very often; last time was Dec 2010. I didn’t think about the humidifier…Good Idea! p. s. LOVE your wallpaper…looks like Ireland…? Thanks Thistle Cove Farm! It is Ireland! I’m glad you like it!